Dave’s Jungle came to Athy Community library on 5th of July. 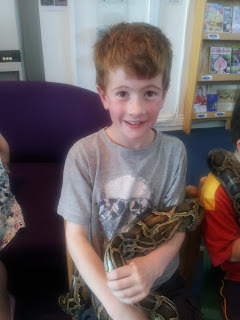 The boys had me mythered all week about what kind of animals he was going to have and if they would be able to touch them. 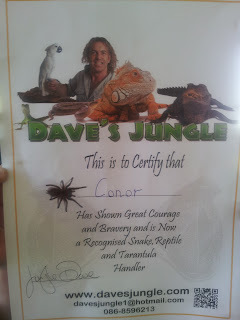 Having no idea myself what Dave’s Jungle entailed exactly, I told the lads to expect spiders and some lizards and I was almost certain they would get to touch some of them. It was better than that! I am glad I didn’t follow through on my threat at approximately 10am Friday morning to leave them all at home after a kneecap made direct, deliberate and very painful contact with a tender groin area. Where do boys learn these skills? I scorched into town, skidded into the one and only parking space left in Emily Square, poured a handful of coins into the parking metre and dragged the lads across to the library where Jungle Dave’s show had already started. Kids sat on cushions and chairs, rapt and not so quiet as Jungle Dave stood before them with a snake wrapped round his neck. We were introduced to Seamus. In fact all of the animals had human names. Jungle Dave walked round the room with Seamus held out to be touched by whoever wanted to. As he walked round I got my first glimpse of the table Jungle Dave had been standing in front of. 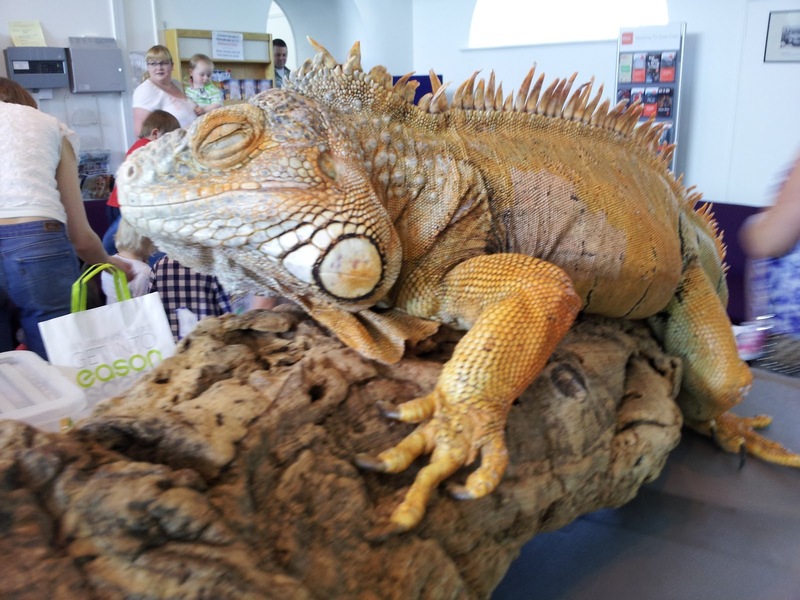 On top of the table was a huge piece of hollow bark and perched on top of that, positively bored looking, was a massive iguana called Eddie. Every so often he would open his eyes, yawn lazily and lick his chops. 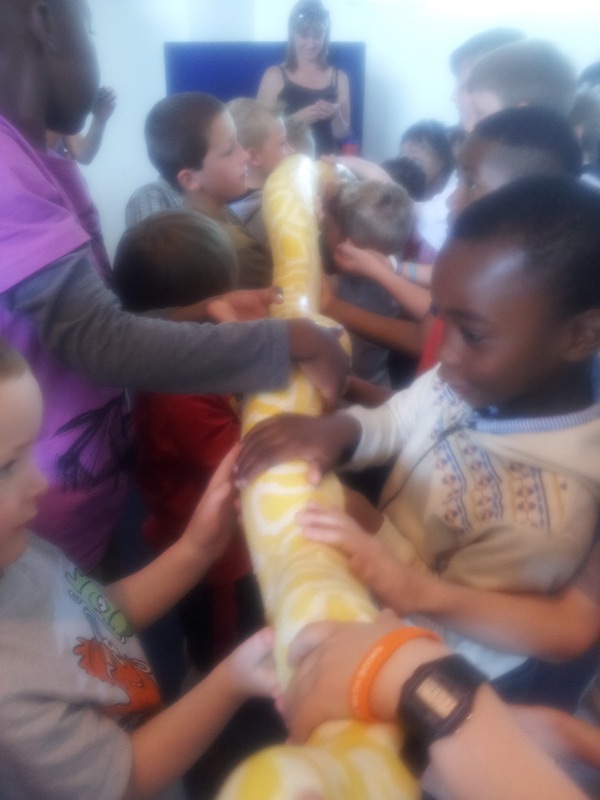 the room and allowed her to stretch out to her full and impressive length as the kids swarmed all over her. Checking her out, rubbing and touching her. A massive, thickly muscled coil of yellow rope, Lucy lay there and took it in her stride. 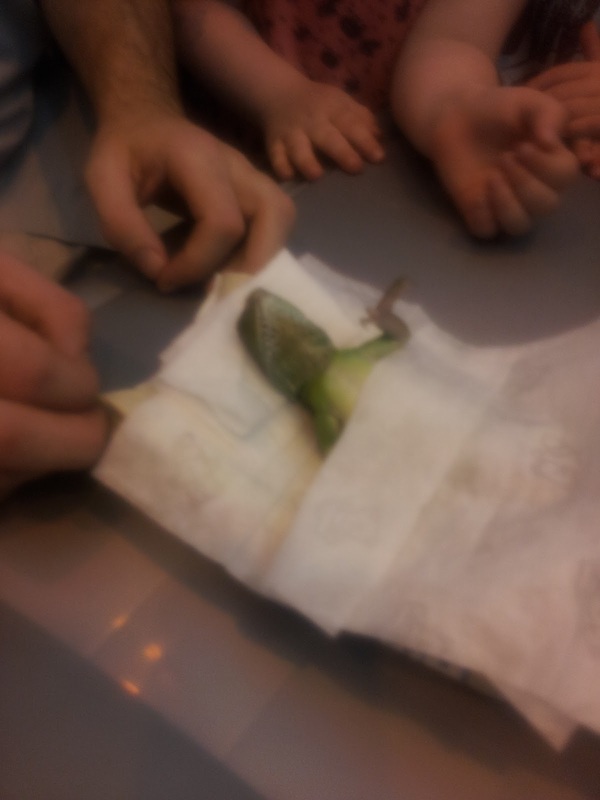 It was time for Lucy to have a rest and Gary the lizard was next. I’m sure Gary has a more worthy title than just plain old lizard but I was too busy watching Jungle Dave trying to tempt Gary to eat a tasty live locust to catch his full name. The locust liked to take the odd random jump at the kids. I’m sure I would too if I thought I was about to become dinner. 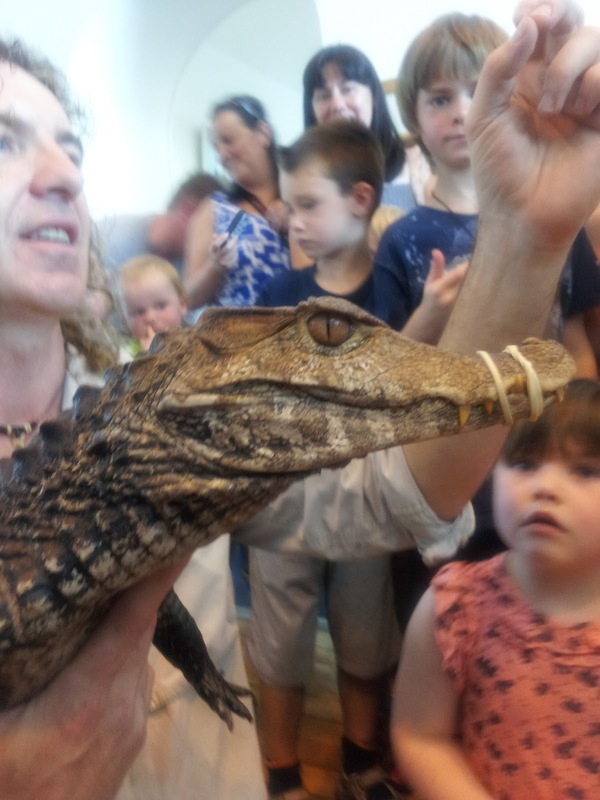 It turned out Gary wasn’t hungry but Jungle Dave claimed to be and he popped the live creature into his mouth amid much screeching and laughter from the kids. It was time for Gary to have a snooze and he was flipped over onto his back and rocked gently until he fell into a gentle slumber and was placed very, very carefully into his tissue bed. 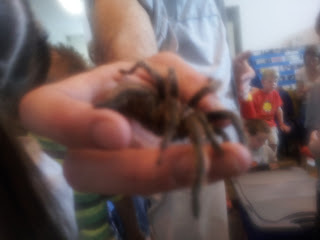 Charlotte the tarantula was next up and Jungle Dave tried his best to produce a length of web from her nether regions but Charlotte wasn’t having any so instead Jungle Dave invited some of the kids to stroke her. Tarantulas have hair that can be very irritating but this had been removed by means of a toothbrush so there was no sneezing or complaints from the kids. The show lasts for about an hour to keep stress levels for the animals to a minimum and just when I thought there couldn’t be much else to see, Kevin the crocodile made an appearance. His jaws held together with a rubber band. It didn’t stop him from losing two teeth as he was on display though. Spike alligator snapping turtle was the most ferocious of the lot; chomping his way through carrots like there was no tomorrow. And then finally, the piece de resistance as far as I was concerned was a black throated monitor lizard, a close relative of that amazing creature the Komodo dragon. 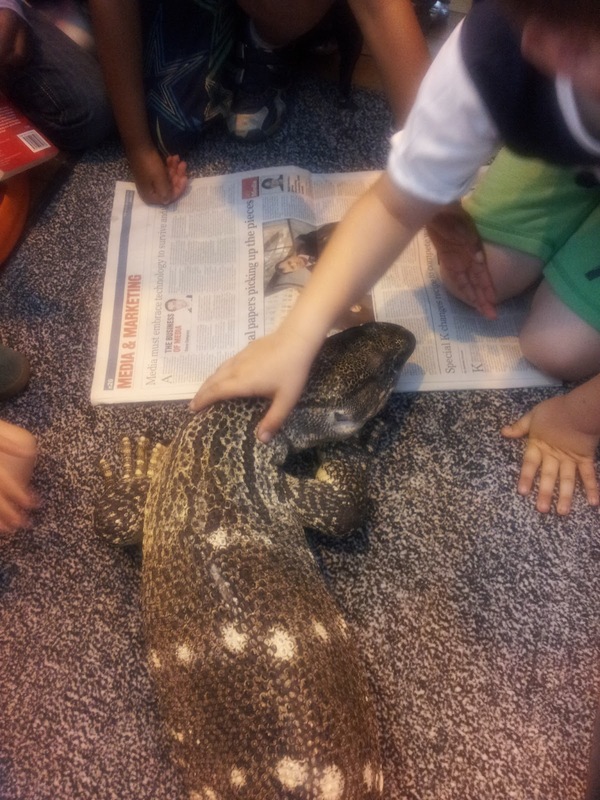 He was hard to see against the rug he was placed on but again the kids swarmed round nevertheless. 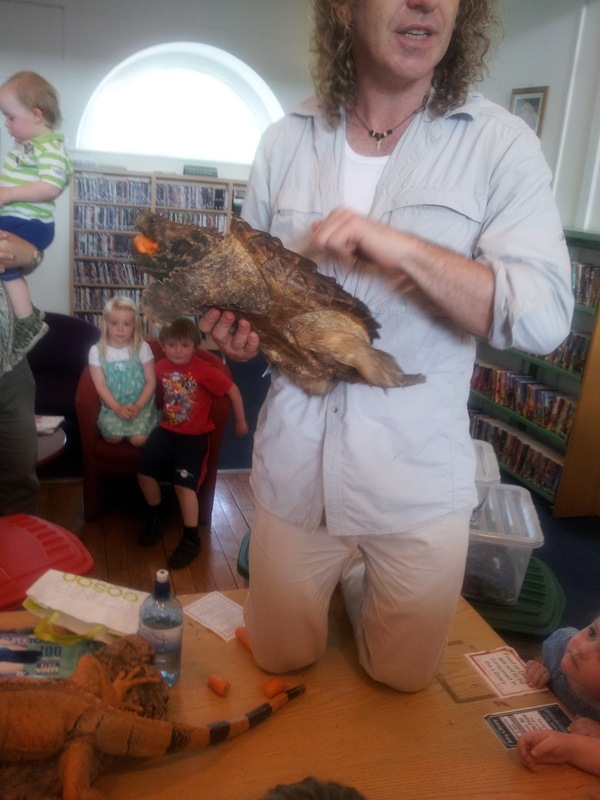 Another great event at Athy Community Library. This guy was amazing. His creatures are amazing. Eddie the Iguana. 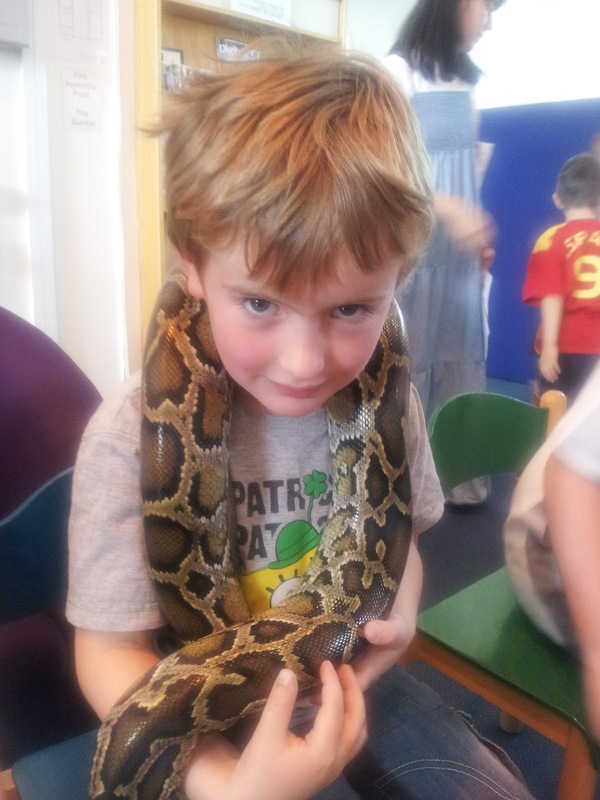 Seamus the snake. Charlotte the Tarantula. Kevin the crocodile. Black throated monitor lizard. Spike the snapping turtle. Gary the lizard and Lucy the Burmese albino python. 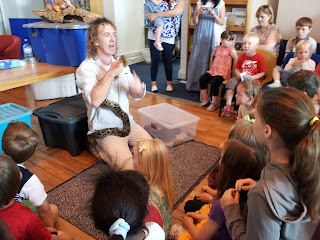 A veritable miniature zoo in your classroom, at your birthday party or local library. Check out Dave’s Jungle website here to make a booking. It is well worth it and you won’t be disappointed. 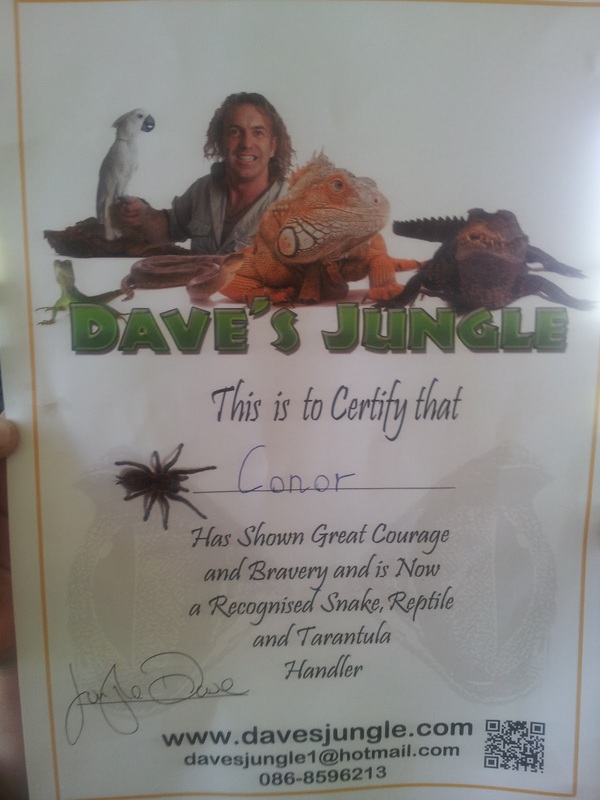 All the kids received their very own certificate of bravery at the end of the show. And it wouldn't be a proper trip to the jungle if you didn't get a snake to wrap around your neck!